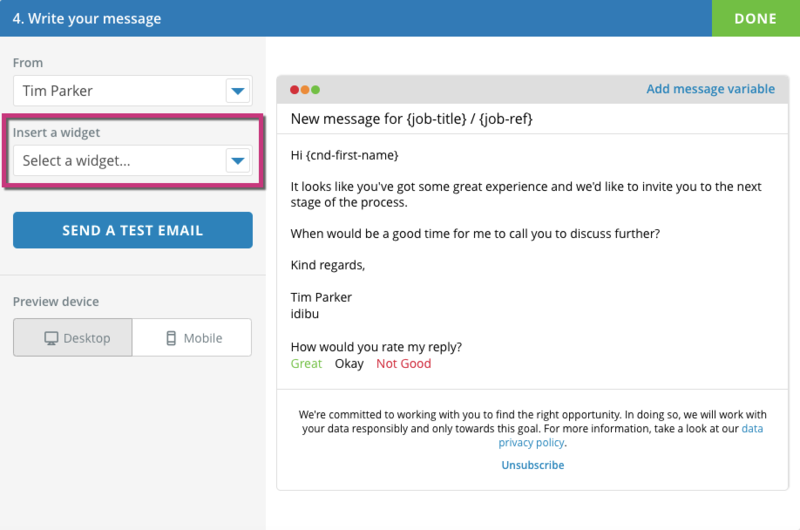 The candidate check in widget is a feature designed to give your candidates a quick and easy social style portal to make quick updates to their profile. Currently it allows them to update their profile picture, email and phone number. It also includes a phase one feature that allows them to rate their happiness in their current role, and their desire for change. This is currently collated as macro level data, provided in the engagement reporting. Who should activate the check in widget? It’s a tool that for the most part, is only likely to prove useful for idibu clients who are using idibu as a stand alone system. In other words, if you are using idibu integrated with a CRM system, then we would normally recommend keeping this tool deactivated. That’s because once you have handed the candidate’s data across to the CRM, updates made via the check in tools cannot be dynamically forwarded to update the details held in the CRM. 1. The check in widget can be activated on a new or existing message during stage 4, “Write your message”. 2. In the panel on the left, you will see a field labelled ‘insert a widget’. 3. Click the drop down arrow and tick the box next to ‘profile check in’. 4. 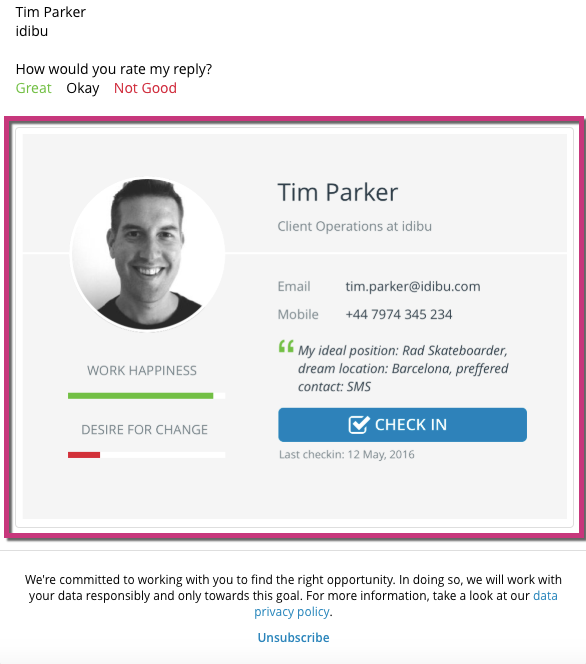 An example of the check in widget will appear at the bottom of the email editor. The version the candidate sees will be populated with the contact details we have been able to pick up from their CV, and a profile image if we have been able to obtain one from the automated social search. If you see the check in widget on a message you are creating/editing and want to remove it, click the ‘insert a widget’ drop down and untick ‘profile check in’.